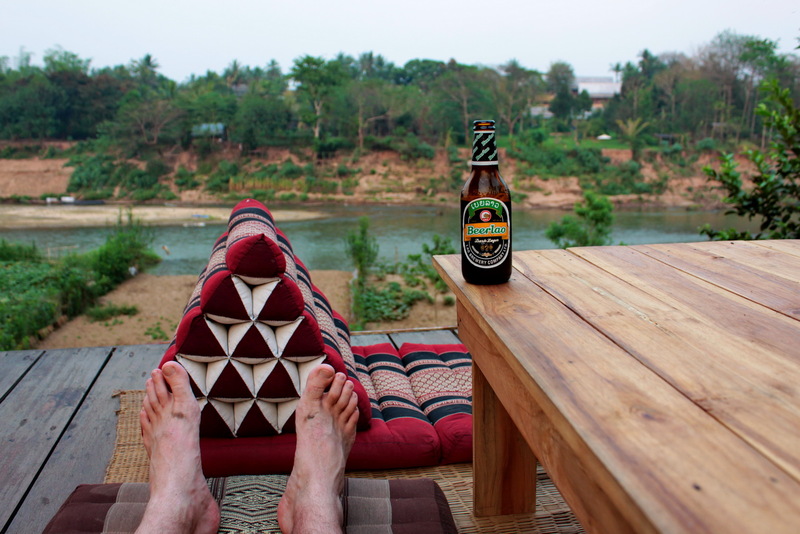 Despite living in Bangkok and being the co-founder of Smiling Albino, an innovative travel company that specializes in customized travel in SE Asia and Nepal, I’d somehow managed not to visit Laos since 2000! My business partner Daniel has headed-up our operations there and with me manning Cambodia and Nepal, year-after-year slipped by without getting next door to Thailand’s sleepy neighbor. Opportunity struck this month and I was charmed by two of Laos’ major centers. My friend Aaron Frankel is the owner and Groovy Map, a company that specializes in fun travel guide maps of regional destinations and needed someone to update their Laos edition. As a freelance writer that dabbles in photography I jumped at the opportunity, did some research, talked with friends living/working in the country for tips to include and jumped a flight to the capital Vientiane. ‘Sleepy’ is a word I continually saw in print while preparing for my trip, describing not just the entire county but also its capital Vientiane and it’s a very accurate choice. This indeed is a slower, sleepier place than its two major neighbors Thailand and Vietnam. Life is slower and the numbers of people occupying the streets is much less as Laos has a small population of just 6.5 million. Thais are famous and their smiles and friendly nature and I was immediately struck at how smiley and friendly Laotians also are which was a treat. Strolling Vientiane’s streets was a pleasure with little traffic and what was there moved slowly. Bikes are abundant and the lack of high-speed motor vehicles made it safe and comfortable to take pictures along the sides of streets. The subject matter for pictures is very rich in the capital and easy to get to on push bike. Just a couple kilometers out of town I photographed people at a forest sauna, then rode a short distance and was shooting colonial buildings then traditional temples. Abundance was all within a pedal. A short flight and Luang Prabang was at my feet. This incredibly charming UNESCO World Heritage Site is a photographer’s dream. Monks stroll the streets, old colonial buildings (or ones that are built to look that way) line the lanes and traditional villages are just opposite the town’s main peninsula. One feels like you’ve stepped back in time here and while much of it is created to feel so it’s a charming environment unlike any other I’ve encountered in SE Asia. 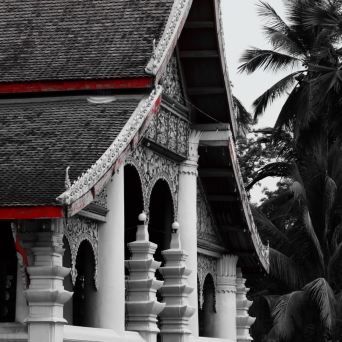 Luang Prabang is perhaps the best place a traveler of any photographic ability can hone their skills and have a lot of fun doing so. It’s almost impossible to go home without a decent catalogue of exotic pictures. Within walking distance there are a variety of subjects, scenes and magic around every corner. See some photo galleries from my trip. Lao was a pleasant surprise on my 7 country 40 day trip to Southeast Asia. I LOVED it. Luang Prabang and Vientiane being my faves. I long to be there again and I’ve only been away for a couple of weeks! Still on SE Asia time. Though my body will adjust my heart will remain there. Thanks for the reminder of how special Laos is. Thanks for your note and great to hear you enjoyed your trip to Laos so much. It’s a very special place as you know and I’m looking forward to getting the updated version of the Groovy Map written and out. Travel safe and thanks for your comment.